The tour begins in our anchor City of North Bay. A visit back in time to the Dionne Quints Museum should be on everyone's list! The Dionne Quints Museum, located in the original Dionne homestead, contains many artifacts from the Quintuplets early days and their growing years. Also a part of the Dionne museum is the Model Railroad Exhibit and gift shop. Traveling North via Highway 11, you will drive through gorgeous Old Growth Forests to Temagami. Lake Temagami is home to Bear Island, the Temagami First Nation reservation. Be sure to stop and climb the Temagami Fire Tower for an amazing scenic 360° view. Continue North on Hwy 11, crossing over the Sgt Aubrey Cosen Memorial Bridge into Latchford, which is the Gateway to Ontario's Wilderness Region. On Mowat Ave in Latchford, stop for a photo with the World's Shortest Covered Bridge as dubbed by the Guinness Book of World Records. Carry on up through the Township of Coleman. If you are a book lover make sure to stop at the famous Highway Book Shop, where you will find thousands of books. Take the Hwy 11B cut-off, where you will travel the curvy road to the National Historic District of Cobalt. In Cobalt, you can take an underground tour of an old mine and tour the Mining Museum and the Cobalt Northern Ontario Firefighters Museum. Follow the sharp turns out of Cobalt and continue on Hwy 11B to the City of Temiskaming Shores. In the former town of Haileybury, be sure to check out the Haileybury Heritage Museum. 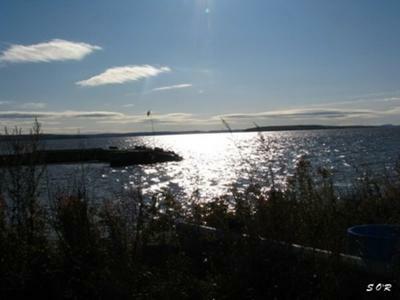 Hwy 11B follows the shore of Lake Temiskaming through the City and her former towns of Haileybury, New Liskeard, and Dymond. Recommended here, is a beautiful side trip up the curvy and hilly Hwy 65 West to Elk Lake. Turning right on Hwy 560, through pristine farm country, will bring you to the town of Englehart. Hwy 560 and Hwy 11 meet up and you continue south down Hwy 11, returning to Temiskaming Shores. Once back in Temiskaming Shores, take Hwy 11B cut-off by Ms. Claybelt, the Giant Holstein Cow (and perhaps stop and take a picture with her! ), and follow south to Hwy 65 East where you will turn left and follow the rolling hills and sharp curves to Notre-Dame-du-Nord in the Province of Quebec. authentic documents and many other books and magazines. A left turn onto Montée Gauthier Rd will bring you through beautiful farm country and rejoin rte 391 where you will turn to right heading for Lorrainville. Stretch your legs in Lorrainville at the Sentier du Lac Zoël hiking trail. Along the trail there are rest areas and picnic tables, as well as 55 nesting boxes and information signs. At the end of the wooded trail enjoy the observatory. In Lorrainville, a right turn onto rte 382 will bring you to Ville-Marie. If you like stories and legends, a stop at the Maison du Frère-Moffet in Ville-Marie is a must. At Brother Moffet?s house, the passionate guides will tell you about the beginning of the Témiscamingue colonies. Take a break from your motorbike and take a historical tour of the town in a Bike-Taxi. Relax while the guides bike you through the town while enlightening you with the fascinating history through humour and anecdotes. Continue on and at the lights in Ville-Marie, turn left and head south on rte 101 to the must-see Fort-Témiscamingue National Historic Site of Canada in Duhamel-Ouest. Relive the remarkable epic of the fur trade with a guided tour that spans from the period of the Anishnabeg people to the role the trading post played. Take a stroll through the Enchanted Forest, located on the banks of Lake Temiskaming. From Fort-Témiscamingue, continue south on rte 101 to St-Édouard-de-Fabre, Laniel and Témiscaming. Take a break in Témiscaming, and visit the Musée de la Gare. The station was built in 1927 and now houses a permanent exhibit of the early years, while revealing its unique architecture. Perhaps take a little side trip to the Wolf Lake First Nation reserve or up to Kipawa to the Eagle Village First Nation reserve. As you cross back into Ontario, make sure to stop at the Algonquin Canoe Company on Long Sault Island. It's owned and operated by the Wolf Lake First Nation. You can rent a kayak or canoe or simply browse through the specialized outdoor outfitting shop and the First Nations fine arts. Continue on Hwy 63 and then turn left onto Hwy 533. This highway, though some work is needed on the road surface, is a beautiful ride to the quaint town of Mattawa. About 10 km east of Mattawa is the Eau Claire Gorge Conservation Area. A self-guided 2.75 km interpretive trail details the natural and human history of the area, including a log slide and dam built for the Mackey Lumber Company on the property in the 1870s. The highlights of this trail are the waterfalls and the surrounding open rock face of the Gorge, and the whitewater rapids found on either side. After touring Mattawa, continue East on Hwy 17 back to North Bay to finish the loop. This loop may also be done in reverse through Québec and then Ontario if desired.